Vivo S1 Smartphone is Here for Photo & Selfie Lovers…!!! Technology changes day by day and new technology has been introduced now very quickly. The demands by users are also rising high and to meet the demands latest smartphones are being introduced in market. Vivo Smartphone Company is also included in this race and come with its latest Vivo S1 Smartphone with so many fabulous features. The latest Vivo S1 Smartphone is a mid-range with 6.53” Full-HD+ notchless display. It has an aspect ratio of 19.5:9 and a Helio P70 SoC mated with 6GB RAM and 128GB storage option. This mobile phone has the best camera for the selfie lovers as it features a 24.8MP pop-up selfie camera and a triple camera setup at the back of the smartphone. In order to its battery life it has a 3,940 mAh battery with 18W fast charging support. For more details you need to check the below described section. The Chinese phone maker Vivo is in the market now with its latest mid-range smartphone named Vivo S1 Smartphone. If we talk about its design then it is much similar to V15 that is also launched in this month earlier. We can say that it is the best smartphone for photo and selfie lovers as it has the strong 24.8PM pop-up selfie camera. The latest Vivo S1 Smartphone is built around a 6.53-inch Full-HD+ notchless display. It has an aspect ratio of 19.5:9 and a Helio P70 SoC mated to 6GB RAM and 128GB storage option. This storage capacity can also be expand via microSD card. Last week Vivo U1 Smartphone has also been announced by the Vivo Company with key features. Vivo S1 Smartphone features a 24.8MP pop-up selfie camera and a triple camera setup at the back. It consists of 12MP, 8MP (wide-angle) and 5MP (depth sensor) modules that is pure camera for the photo capturing lovers. Here is one more thing in this smartphone that is the company’s Jovi AI-based voice assistant that can be summoned by pressing a selected button which is located on the left side. It also has Game Turbo mode up for a better gaming experience. The Vivo S1 is available in Ice Lake Blue and Pet Pink colors with a rear-mounted fingerprint scanner. It packs a 3,940 mAh battery with 18W fast charging support. 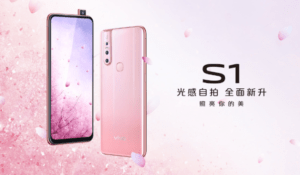 The starting price of Vivo S1 is priced at CNY2298 ($342/€304) and it will go on sale in China from April 1, 2019.